The thing that gets most of us up in the morning is a nice big dose of poison. Fortunately, it's not poison for us. It is, however, something that's left a trail of dead snails in labs, and that we crave every morning. There's decidedly mixed data on whether caffeine is good for people or not. It can do many things, including sharpen your attention, stave off Alzheimer's disease, and decrease your risk of cancer. It also cranks up your blood sugar, interacts adversely with your prescription medication, and increases your risk of cancer. (Cancer is annoying that way.) But what does caffeine do for the plant that produces it? It's not that we haven't serendipitously found some great medications in plants. It's just odd that certain plants should develop this miracle substance that does so much to the human body. The miracle substance, as it turns out, does a lot for animal bodies as well. Specifically, it creates piles and piles of animal bodies. Caffeine is a potent pesticide. Although there are insect who have adapted to caffeine, most lie down and die when they get a dose of it. After spraying lots of produce with caffeine solution, and watching snails and other bugs stop feeding to curl up and die, scientists believe they understand the mechanism. 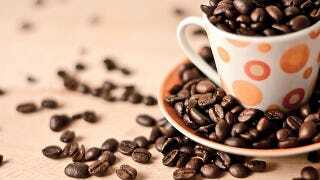 Caffeine inhibits the workings of a certain enzyme. This enzyme is meant to break down adenosine monophosphate. It works as a messenger in cells — in particular the messenger that drives up the bodies use of sugars and of a little hormone called adrenaline. But adenosine monophosphate isn't all good. It's also a waste product. It forms part of RNA, and when RNA breaks down, the adenosine monophosphate is meant to further broken down by enzymes and excreted from the body. If the adenosine monophosphate isn't broken down, it just circulates in the body, throwing off the metabolism, overstimulating the production of hormones, and poisoning the system until the entire body breaks down. This is easier to do in a snail than in a full-sized human, so we escape the deadly effect of coffee with little more than a spring in our step.